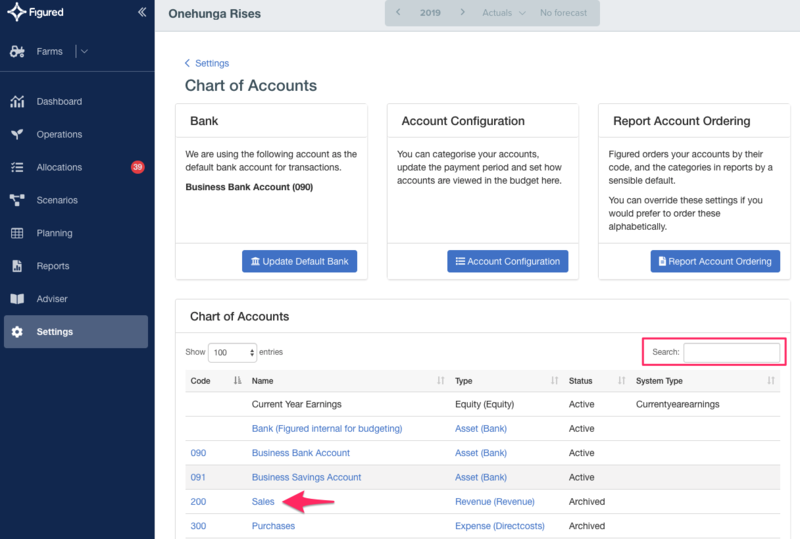 Once you have set up your chart of accounts and brought them in from Xero, there may be instances where you may need to edit the type, contra or bank feed it relates to. Accounts edited in Figured won't flow back to Xero - it won't change any of your Xero account settings. To edit your accounts, head to your chart of accounts in your farms Settings. Then use the search function to search for an account code, name, type, or status (whether it's active / archived). From there, you can edit an account by clicking on the blue account name. On the screen that follows, you'll be able to change its type, contra, or bank account (where you would like the transactions (in / out) to be sitting against in budgets / forecasts). To adjust the settings, select the tick box to the left first and make your selection in the drop down. Click on Update settings or Reset settings to restore to default. NOTE: Ensure your depreciation accounts are correctly setup.